We have received the feedback and comments from the host family! The guest was really nice and we all enjoyed our time together. I couldn’t ask for a nicer experience. CHS planned everything very well and communicated the plans very thoroughly. 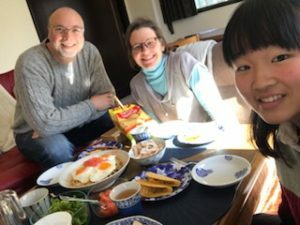 Our guest, Momoko, was friendly and cooked a delicious dish for us. She enjoyed practicing her English, and we enjoyed getting to know her. Why The Guest Applied for this Homestay Program? The guest thinks that it is a good opportunity to communicate with the people from abroad and ask what they think about Japan and what are the good parts and bad parts living in Japan. She would like to know the foreigners’ point of view since most of the Japanese people are thinking and seeing only from the Japanese point of view.Also, by joining this program she hopes to improve her English speaking skills including pronunciation and using phrases. Join us as a host family to support Japanese students!